A Seasoned Journalist Chases Down the Leads in the Biggest News Story in History If you were a journalist, how would you handle a news story so big it would utterly eclipse all other world events? How thorough would your investigation be? How many hard-hitting questions would you ask? How carefully would you consult with top experts to get detailed, accurate answers? Lee Strobel knows firsthand. It was as a reporter for the Chicago Tribune and an avowed atheist that he first investigated the greatest news story of all–the Gospel of Jesus Christ. Now, in The Case for Christ, he presents compelling evidence and expert testimony for the claims of Christianity. As a seasoned journalist with a Yale law background, Strobel systematically tracks down his leads and asks the blunt, tough questions readers themselves would want to ask–questions that can make or break the Christian faith. He refuses contrived, simplistic answers. Instead, he pieces together hard facts through interviews with more than a dozen of the country’s top scholars. 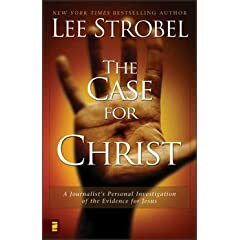 Written in the style of a blockbuster investigative report, The Case for Christ is apologetics at its most imaginative–gripping, compelling, marshaling expert testimony and incontrovertible evidence. With unerring instincts, Strobel ferrets out Historical Evidence: Do we possess reliable documents concerning the life, teachings, and resurrection of Jesus? Scientific Evidence: Is there archaeological substantiation for the historical accounts about Jesus? Did Jesus perform miracles? Psychiatric Evidence: Did Jesus really claim to be God? What evidence is there that he fit God’s profile? Fingerprint Evidence: What does prophecy have to say about Jesus? Other evidence: Jesus’ death, the missing body, eyewitness accounts, and claims of personal encounters. The Case for Christ reads like a captivating, fast-paced novel. But it’s not fiction. It’s a riveting journey to the truth about the most remarkable event in history: the death, burial, and resurrection of Jesus Christ. And it’s a revealing, personal testimony to his power to transform people yet today–even the most cynical, hard-bitten journalist. This entry was posted in apologetics, Bible Study, personal, reading, video and tagged Bible Study, Christian Apologetics, personal, reading, video. Bookmark the permalink.